David Hellman and Dan Berry talk about collaboration, the creative process and running a kickstarter campaign. Dan Berry: This is Make It Then Tell Everybody. I’m Dan Berry. David Hellman and I talked about collaboration, process and getting into and through a Kickstarter campaign. This is Make It Then Tell Everybody. Hello David Hellman, how are you? David Hellman: Hi Dan, I’m great. How are you doing? DB: Really good, really good. Thank you for asking. DB: So most people are going to know you from a video game. DH: Yeah, that’s right, Braid. DB: This is a fairly successful video game, I think I’d say. DH: It came out 2008, and it was one of several indie games that year that broke out more than independent games had done before. Now independent games are a big part of the game industry, but yeah, it was one of those early ones. DB: So you did the visuals for this? You’re an artist? DH: Yeah, I did the majority of the artwork for that. DB: Nice. So is you background, is your training in art? DH: Yeah, I mean, my background was just in drawing forever, since I was really small, but I did go to art school after a failed attempt at a general college experience. I took some time off and then I went back to my hometown of Baltimore, and ended up going to MICA, the Maryland Institute College of Art there, so I got a fine arts training there. DB: Cool. Okay, my question is, what kind of student were you? DH: I was a general fine arts major. There’s another phrase for that, for GFA, but I don’t want to ruin your… I don’t want you to have to put an explicit tag on this, but it’s General ‘something’ Around. DB: Okay, so I’ll bleep that, so it sounded like you swore anyway. DB: So were you, in terms of the classification of students, were you one of those things that we’d have to bleep out, or were you one of the hardworking, dedicated ones? DH: I was dedicated. Well, I don’t know, I was always trying to do my own thing, so I would always, kind of, try to wriggle away from whatever the prescribed route was, and I felt like I had to create my own path. That comes with its own challenges, its own ups and downs. DB: So when was this then? DH: Well, let me see, I lose track. I actually finished high school in 1999, and then went to college. I went to Hampshire College in Massachusetts. That didn’t really go anywhere, so then I came home. I think I was back in school in 2002 or something, and did four years from there. I guess I finished in 2006. DB: I think I must be one year ahead of you, because I did a similar thing where I didn’t go to do a degree until I was a little older. Do you think there’s a value in waiting? Because I do obviously, but I’m biased. DH: Well, sure. I won’t disagree with you. I didn’t wait, at first I went right into college, but it’s mostly just to move on from, you know, by the end of high school I just wanted to leave. DB: So you weren’t in home, yeah. DH: Yeah, I just had to get out of there, and there was a route. People were saying, ‘Go to college! You know, it’ll be a great experience!’ But I wasn’t ready for it. I wasn’t even thinking about artwork really at that time, even though I’d always grown up drawing. I think I took it for granted that I was always the guy drawing and doing comics and stuff, but at that point, I think I was a little directionless and I wasn’t thinking, ‘I’m going to study art, and really make this work.’ I went to school and took some sociology classes, and literature, and things like that, and didn’t really learn much. I didn’t really apply myself, so I came back home, and then I went to art school after working for a little while. At that point I was ready to focus on art. DB: You knew what you didn’t want to do as much as you knew what you did want to do. DB: Because I worked on building sites and places like that, and that really cemented for me what I didn’t want to do. I didn’t want to work in a petrol station, I didn’t want to work on a building site. I wanted to do something. That was my motivation for going. DH: Yeah, that makes sense. I mean, I worked at a restaurant for a little while. In a way, my creativity felt healthy at that point, at least my urge to create was healthy, because I had to… I was just working at the restaurant and I was a host. This was for less than a year, but this was a little intermediate thing I was doing that was in-between leaving college and going back to art school. I was just daydreaming all the time about the comics I wanted to make, and the games I wanted to design, and things like that. I would scribble on a little piece of folded up paper, a little 8.5 by 11 paper I’d folded into four parts, and when I had some time I would draw on it and everything. I think having all my time occupied with the job allowed my imagination to flourish. It’s a different thing when you’re really dedicated to… when you achieve that position of having all the time in the world to do your work, it’s a different relationship, you know what I mean? DB: It was still romantic then. DB: (Laughs). So has the romance gone now? DH: No, but I think there’s a maturation process you have to go through to handle it, at least for me. It’s more complicated, but I think I try to force myself through a process that would lead to that, kind of, self realisation that I’ve been going for, which was to force myself to do a graphic novel, because I’d already taken everybody’s money. DB: (Laughs). Let’s work back up to that. DH: Okay, that’s a teaser. DB: Ooh, it’s foreshadowing. This is good storytelling, that’s what this is. So I guess Braid was this game you did the artwork for, and it was a successful game, but I’m guessing that just going off and going to art school doesn’t necessarily qualify you straight for working at that level. What were the steps that came before that job, that led up to that job? How did you get in the position where you could do it? DH: Well, I kind of jumped around from one thing to the next in a funny way. While I was in college I started working on my webcomic, A Lesson Is Learned But The Damage Is Irreversible with my buddy Dale Beran, who’s also a writer and a comic artist in his own right, but we worked together in that, him as the writer and me as the artist. Our idea was to stave off the necessity of having to get quote, unquote a real job, or have to work for a company. We didn’t want to have to submit to somebody else’s BS, we wanted to be able to do our own thing. We were very, kind of, maybe overconfident young people at the time, and we thought everything else was nonsense, so we were going to carve our own path. DB: But that’s the best thing about being young, is you already know everything! DH: Yeah, it’s the best time to know everything. DB: It is! So this was a webcomic, so A Lesson Is Learned But The Damage Is Irreversible, so explain the process of this beginning and how it matured. DH: Well we saw other webcomics starting, like we saw Penny Arcade and they’re huge now, but they were just starting out at the time. We saw ourselves as peers, like, we’re going to do the same thing. I remember Dale and I would just hang out all the time, we both lived in Baltimore at the time, and we would go for jogs and talk, and talk about everything in our lives. We still are really close friends and know what each other… we know each other well, and know what the overlap is, in our personalities and interests, so we can easily find our way to stories that would excite both of us, and be relevant to both of us. We briefly talked about designing worlds and designing character sets and everything, but it seemed like far too much planning, so actually what we decided to do was just begin to use ourselves, like tell stories about ourselves, which can be very solipsistic, and in a way overdone. You know, it’s the easiest thing, just start doing a little comic about you and your buddies hanging out, playing games or whatever. It was just the immediate jumping off point, and then we started to… Dale will come up with these crazy surrealist parables, modern parables that were influenced by popular culture and our sense of absurdity, and our sense of young romantic yearning and all the things we liked in media. So they were very different, one to the next, and that was exciting to me, changing it each time and pushing the layout and changing the art style. We had, early on we were searching the internet, searching forums for discussion about our comics. DB: That can be healthy and it can be really unhealthy, can’t it? DH: Yeah, but I think it was motivating in this case. Somebody said the line work was sloppy, so the next episode had no line work at all. It was just colour, more like painting, just colours side to side. But I didn’t feel intimidated by that, because I can be hurt, certainly, by criticism I agree with, or that strikes a chord, but criticism I don’t agree with emboldens me, and I like it. I actually feel encouraged, like good, you didn’t get what I was doing. DH: Right. So we’d evolve and it was this exciting, wilful, free process of just changing it every time and feeling very little pressure, because it was just starting from nothing, and we’re just high school buddies who are doing something on the internet for fun. So that just evolved, and you’re asking how that led to Braid. I’d done some work in video games, some collaborations with friends in college that hadn’t resulted in finished games or anything, but I had a little experience doing game assets for prototypes. It was just always something I was interested in, so it was a really lucky gig. Braid became successful and Jonathan Blow, the creator, is a super smart, super well regarded guy who’s working on his next huge epic game now, but back then he hadn’t quite made his name yet. To me it was just a really lucky gig with an independent developer who was starting out also. It’s just really lucky. DB: How was contact made then? DH: Through a friend. My friend Eric John Terren, who was a writer for gamasutra.com (ph 11.49), and he’d seen Braid at a game developer’s conference. He asked Jon, ‘How’s it going?’ and he said, ‘Well, I’m looking for an artist,’ so we were put in touch over email. DB: I see, okay. So I think one of the things that struck me when I was reading your work is that it seems to be characterised through collaboration, you’d say. You’ve worked with a lot of people. What do you think the key characteristics of a good collaboration are? Is it a case of making the relationship work, or is it a case of finding a relationship that will work, or is it somewhere in the middle? DH: That’s an interesting question. I think there’s always an element of making it work, but sometimes you’re just lucky and it’s not as much work to make it work. DH: With Dale, for example, it’s really easy because we’re both… we understand each other really well, we have a very similar sensibility, we’re both, I think, deferential by nature. We don’t like to be the guy imposing his idea, and yet we’ll make the point when we think it’s important. So we have a way of getting out of each other’s way nicely, but then coming back and giving feedback, and it’s fun, it feels fun. It’s not like we’ve never had disagreements and stuff, but the vast majority of our work together has been pretty smooth. So it kind of depends. Does that answer your question? DB: Yeah, it’s like a marriage, you’ve just got to make it work, but you fall in love. DB: First, and then… no, I don’t know where I’m going with the marriage thing. You’re not married to any of these people, I’m going to assume. DH: I’m not married at all. DH: No, I have a girlfriend. I’m in a committed relationship. DB: (Laughs). Back off listeners! Can I ask you about your process then? Do you take a script? Do you work from notes? 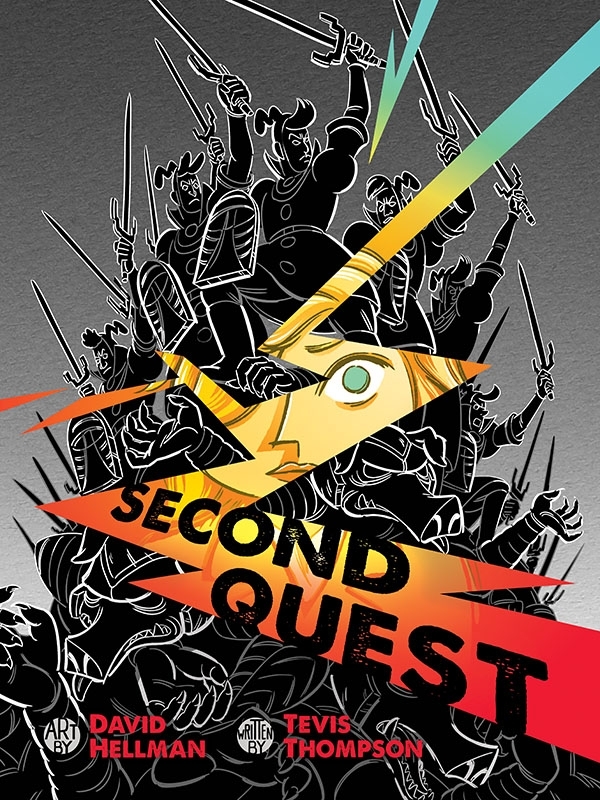 If you’re working with a writer, because you had this book that’s out very recently that we were going to talk about, Second Quest. DB: So how does the process for something like Second Quest work then, physically? DH: Second Quest was a really strange process, I’m not even sure where to begin. The origins of it and inspiration for it came out of some reactions to a video game, and a lot of conversations about concepts we wanted to get at, and there was an argument we were trying to make, and there were things we were trying to reflect about video game culture, but the process itself… so the writer’s Tevis Thompson and he’s an essayist and fiction writer. This is his first… well it’s both of our first graphic novel. We talked around the themes for a long time, and discussed various plot outlines and settings and ways to take it and it evolved quite a bit, culminating at a certain point with a script that continued to evolve as I was doing layouts. So it was a very back and forth process. Lots of talking, lots of discussion and conceptualising, and then a script and evolving documents as we continued to work it out. He didn’t know how the script would translate to the comic, nor did I really. He asked me, ‘What kind of script would be useful to you?’ and I basically said, ‘Just describe the scene and the events as you see it. You don’t need to go into excessive detail, but the words and the blocking.’ There were no panel notes. DB: Oh, like ‘panel 1, do this’, ‘panel 2, do this’. DH: Right. Dale doesn’t do that either for me, because I like to do the panel blocking myself. I like to do the layout and blocking myself. DB: Yeah, same. I mean, it often is me writing, but I like the story to tell me where I’m going to put the panels. Maybe I’m selfish? DH: But you’re the artist. You’re the visual storytelling expert, so you get to decide what the images are. That’s how I think about it. DB: There we go, your way of saying it is much better than my way of saying it. Okay, so you have this script, what do you do to get the words from your head onto the page? What’s your first step? DH: My first step with Second Quest was to block out the entire book in an incredibly rough form. So rough that it was almost useless as a document. I think it was more about just doing it the first time, and having a really terrible first version and being done with that. When I say ‘block out’ I mean four pages per 8.5 by 11 page, just scribbled in as an exercise to imagine how much space I would need. The script turned out to be very dense, so that first exercise already showed me that it was going to be hard to fit everything in, and in fact throughout the entire process of doing this book, fitting everything in remained a challenge. We ended up making the book twice as long as we originally planned, twice as many pages and it was still, I feel like the pacing is still dense. It’s still tight. It doesn’t leave a lot of open moments. I read other graphic novels and often artists spend two pages just on an atmosphere, just to let a moment stretch out, and I love that, but we didn’t have the luxury of doing that. Anyway this first exercise was just to get the general rough idea, but it was also just to force myself to do anything, because I don’t know, I’m intimidated at the start of the process. Then the next stage was actually doing careful layouts, where I would really look at each page and say, is this a good layout? Not just think about how much space do I need, and draw really crude thumbnails, but what is the layout? I remember which page I started with, and it was crude, it didn’t look very good, but as I went through, what I was trying to do was establish a consistent way of structuring the pages, rules for arranging the panels and how they would flow. DB: Yeah sure, that makes complete sense. DH: Yeah, because I was very concerned that it be consistent from beginning to end, unlike my webcomic, which revelled in being different every time, this would have to be consistent. That was a new thing for me. DB: How did you deal with having to be consistent? I think I read an interview with you somewhere, where you said that you get bored if you do the same thing over and over again. You want to change it up and do something new, so how did you square that away with yourself? DH: It’s not so much that I got bored in the process of this, but I felt a lot of pressure to make the right choices at the beginning, so I could live with them for an entire book. DH: So what is the look of the art? I ended up inking it on paper, but most of my work has been digital. What kind of colouring style will work and be efficient enough that I can get through all these pages? I was constantly dealing with the scope of the project, because as I said, it got to be twice as long as planned, and we took twice as long to finish it. I was always trying to problem solve and deal with the scope of it. But you know, the consistency, it was also an appealing challenge because I like coming up with rules. It helps, you know? I wanted the book to have a unique look, and I love panel layouts. I made, sort of, a grid, a guide for composing the panels, so borders tend to be a certain width. I didn’t want to just eyeball it for every page, I wanted to know, this is the standard width. Every book does that, but my tendency is to do more of a freewheeling thing where the panels can be anything, and I knew if I just went in and started painting pages, like A Lesson Is Learned style, go and make a mess and then clean it up, it would take me ten years to do this book. I needed to have a system where I’d be making choices within a structure, and could count on that. DB: So you’re trying to get all of your decision making out of the way sooner, so that then you can just do it. DH: Yeah. It’s hard to know when to switch from decision making, pre-production to just doing it, and I find, well in this project I always had to make that switch before I was comfortable. It might be that I could have made the switch earlier in a lot of cases. I wanted to stay in the pre-production stage, I wanted to think more, and plan more, and be reassured that I was on the right track, but ultimately I found that there was always a limit to what my ability was at that point, given my experience and what I’m capable of now, or then. So I just had to accept that and move ahead. You can always put more time into something in theory, but in practical terms you’re limited by finances and things, so you have to move ahead. So you can really only do as much as your capability allows you to do, within a reasonable time frame. I would love to design characters that… you know, I think character design is something I want to improve on. There are elements of design that I wish I could have spent more time on, but I don’t know that time is really the answer. I just had to say, ‘This is what I can do now,’ and then go onto the next stage. But once you’re in that next stage, some things to get worked out. I found that basically at every stage I would start, go through the whole book. Say layouts, start doing the rough layouts, just roughing them in on my computer digitally, go through the whole book, and then I’d always have to come back to the first 20% or something, and redo them. DH: That basically seemed to be how it always went. Is that normal? DB: Yeah, I think so. That seems to be my experience. You do the rough layouts digitally then? DB: I can’t do that. I’ve tried and tried, but I think having that infinite safety net underneath you of working digitally, I don’t know, it gives me stage fright. No, it’s not stage fright, it gives me the illusion that I can perfect it. That just crunches me into a little ball and I can’t do it properly. I have to do something on paper that has the feeling of permanence, that I have to then… I don’t know. I don’t know what it is! This is a psychological thing, maybe it’s a problem, I’m not sure, but I find it much easier to get… not even with pencil, you know? If I do pencils I know I can erase them. If I go in with ink and do my thumbnails, I mean, my roughs, the first pass is a couple of inches tall. They’re not huge at all, but I find that doing them in ink, I feel like I own all of my mistakes, rather than having to avoid them. No, I can be definite about the mistakes I’m making, and I’m happy to make mistakes at that point. DH: That’s a good way to put it. Yeah, I like that. I understand that. My sketchbook is all ink, so I like to go directly in with inks, but for layouts, I mean, do you find that panel layouts are pretty intuitive? Do you like the results when you just go with your intuition? DB: Yeah, the way I think about it is, when I’m working from my script I’ll have taken the… I talk about it in terms of beats. What’s a nice way of putting this? It’s like a visual punctuation point. It could be dialogue, or it could be an action, or it could be he picks the cup up, he puts the cup down, that sense of closure and continuity within the story. Oftentimes it isn’t in the script, but it’s in what you’re thinking about. I break that then into discrete parts that I’ll think of as a page, and then I’ll think of the first and last panels simultaneously. Where does this need to begin, where does it need to end? Then work my way from the beginning and end of that page towards the middle to make sure that it all joins up, and that I’m not overdrawing the middle bit and then I realise I can’t fit the last bit in. That seems to work out okay for me, but my layouts are by no means adventurous. Mine are all just squares, oblongs. You’re doing things, you know, it’s strange shaped dodecahedrons or something, floating across the page, free from my stilted view of geometry! DH: Well, I’d like to do something more direct really. I’m always trying to get something more direct, more intuitive, because I think when it flows that way you get, I don’t know, something more natural or true. It’s also torturous to be locked in a process that is so heavy on design and that feels like a puzzle at every stage, even though that’s kind of appealing. It’s part of the appealing challenge of it, figuring out the spatial puzzle, but I can get locked up and it’s frustrating. There are so many versions of some of the pages, and again, fitting everything in, and hitting those beats, and giving enough space to each moment. You look through the book, it’s pretty dense. Did you feel like it’s pretty dense and things just keep happening? DH: I hope so! Thanks. I don’t mean to be overly self-deprecating. I feel like it works, but I would love to explore something with more room to breathe. I think that would be nice, to be able to show a moment from different angles, and take time with it. Think about the expression, the editing that way, because it was very much a puzzle, how to fit everything in. I think it’s a good read though that way, because there’s a lot to unwrap as you go through. DB: So you’ve got these thumbnails, this first pass at the story. How do you then transform that into artwork, because you said you did it on paper, but it starts in the computer? DH: I print it out, the layouts, and then I use a light box and draw over it with ink. I do that because I want it to look like my sketchbook, because my sketchbook is just ink directly on paper. DB: You mentioned this earlier and I was going to ask about it. When did you make the jump from thinking of it as a sketchbook to being an ink book, for want of a better word? DH: Oh, you mean my actual sketchbook? I’ve always drawn with ink in my sketchbook. DB: Gone straight in with ink? DH: Yeah, I’ve always just drawn with ink directly, I think because pencil smears. Like, I had sketchbooks in a more traditional sense of a book that you sketch in and just make a mess in, like in art school, and I would draw in them with pencil and charcoal and they’d get all smeary. I like more the books that had ink drawings that had little designs and comics and stuff, all juxtaposed, a variety of stuff to look at, and that would hold up and be in good shape a few years later. I just liked doing those more, so I go right in with ink. DB: I remember, this is quite a long time ago now and I don’t have them anymore because I threw them all away. DB: I’m not precious about my sketchbooks, they’re something I can put an act into, they’re not an artefact by themselves. I remember making the conscious decision to stop sketching, and by sketching, I was using a hard pencil and trying to find that line, that woolly, sort of, ‘Is it there? Is it there? There it is,’ and then going back over it with ink and just killing the drawing every single time, and it took five times as long to do anything. I remember thinking, ‘Right, just go in with ink, own your mistakes, they will become part of your style,’ and I wanted to do my comic pages with watercolour, but I hadn’t really had an awful lot of practice, but I was trying to really control the process, and you realise you can’t really control watercolour particularly well. It’s treacherous. But I remember making that decision, ‘I’m going to own all my mistakes. I’m going to go straight in with ink. I’m going to do my crosswords, my Sudoku in ink, and I’m going to just live with the consequences.’ A whole bunch of doors opened inside my head, and I was like, ‘Ah, I can do anything!’ It was a revelation to me really, I think. If you’re listening and you’re over fussing your sketchbooks, just go straight in with ink! DH: Yeah, I agree. I think because I like to hang back and think everything through a lot, like with the layouts for this book. I think that’s why I like the other side of it, just going in with ink in my sketchbook. Sometimes drawings turn out badly, but then sometimes I’m just surprised how well it comes together, and when you’re used to doing that then you can pull it off more easily. You start to be able to visualise where it goes, and you can just block it in and it’s there. It’s like, ‘Hey, it’s done. I did a little drawing and it came to life.’ Trying to reproduce it is hard. I actually had to learn how to trace over… it’s not tracing, obviously it’s redrawing, right? DH: It’s inking, so that was one of those stages that was way harder than I expected, because when I’m looking at the sketch underneath it’s harder to be spontaneous, so I was doing drawings that totally sucked, that just looked terrible. It was one of those moments in the process where I thought, ‘My approach is wrong, I’m going to have to totally change it. This isn’t working, this is going to be terrible, the book is going to be terrible.’ I wanted to go back and just work all digitally, and I agonised over that for a week and a half, and called friends and said, ‘I’m going to go back to digital,’ and got talked down off the ledge. DB: ‘Be strong! Be strong, you can do this!’ I have exactly the same thing. I remember thinking, you know, when I made this jump from thinking just in pencils to thinking in ink, that a nice way of thinking of it is, it’s a bit like learning a language, and it’s all about fluency, but I’ve found that working in pencil was one language that I was getting fairly fluent in, but it didn’t look anything like this language, the ink language that I was doing, because I wasn’t getting enough practice speaking it. Having more practice with ink increased my fluency in this language of ink, so when I’m coming to do the ink work at the end of the project, I’m more fluent and I feel I can bring more personality to it. I still do the pencil work for rough pages and things, but my roughs are very rough. I get an idea of the character, I get an idea of the composition, I get an idea of the background, and then I leave it at that. I don’t add details, I don’t sweat making sure that the eyes are the right size or in the right place, because I know that when I come to ink it, it’ll be okay. One of the things I do is I’ll put in an extra sheet of paper between the rough and the final watercolour paper, or whatever, on the light box, so it’s more indistinct, so I can’t see it to trace it. You’re right, there’s a big distinction between tracing and drawing, and I think tracing for me just kills it, kills it dead. It looks terrible. DH: Yeah. I had to learn a different kind of concentration. To see it, but not try to imitate it. DB: That makes sense. Okay, so what do you use to draw with, when you’re doing the final stuff then? What pens do you use? DH: For inking I’ve been using… I use a Zebra pen, it’s not at all an art pen. It’s a little clicky back Zebra pen. It’s a Zebra G-301 Gel, and it’s got replaceable ink straws inside. It’s bleedy a little bit, it makes a little mess and my sketchbook has a bit of tooth on it. The brand is called Hand.Book. It’s like a Moleskine but I like it better, I like the paper quality better. The Moleskine books I looked at either have really smooth paper. I don’t know if it’s watercolour paper, but really smooth, yellowy paper, or it’s really thin. I couldn’t find a paper that I really liked, and this brand, it’s got a bit of tooth. It’s a little heavier weight, so then I have the pen at an angle, and get a scratchy line because of the tooth, so it’s a little rough. After that I use a Pentel Brush pen, that’s got refillable cartridges. DB: Yes! Yeah, they’re good. So you’ll do that on the light box. So you’re doing all of the line work on the page, or are you doing some element of colour on the page as well? DH: Just the black inks. Just the line work and the brush pen. I found a paper that had texture that was like my sketchbook. Then I scan it, and then I go back into the computer for shading and colouring. DB: Do you have any magic, special workarounds in Photoshop for colouring? DH: I don’t know if it’s a workaround, but I came up with my own process for this book in particular, which was, when you look at it you notice that the atmospheric perspective, or the atmosphere is a prominent feature. It’s basically two colours. I have a copy here too. DB: I’m going to flip the book in front of the microphone. (Pages turning). That’s what it sounds like. DH: Yeah, listen to that! DB: So, atmospheric depth. Tell me about atmospheric depth then. DH: Well I wanted it to be vivid, I wanted there to be a lot of colour in the book, but I didn’t want to go in and just paint the native colour for each object. I just thought I’d get lost in that. I was constantly trying to figure out a process that would be efficient, so I decided if I could get it down to two colours per scene, then I’d only have to choose two colours and that would be easier. DB: You could either be right or wrong. DB: And if it’s wrong, just swap it! DH: Right. Also I was thinking of video games. Again, it’s related to games, so I was thinking about palettes. There was a Game Boy player that let you play Game Boy games in your Super Nintendo. The Game Boy was just monochrome, but the Game Boy player would let you assign colours to each of the four green values. So I was thinking about that, and you know, really the restricted colour palettes of early games. That was in my mind. I don’t know how much it comes through. I was thinking about picking two colours per scene that would communicate the atmosphere, the emotional tone I wanted, but also enough of the location and time of day, and things like that. You know, is it warm out? Is it a cold place? Is it sunset? I tried to get both of those things somehow, and also use the colour to identify certain locations that are returned to. I wanted to feel like, okay, every time she goes home it’s the same purple and orange. Then there’s another location that’s not her home, but I wanted to reference the home, so I used the same palette, things like that. So it became a kind of scheme, and what I had to do was create a depth map for every panel. DB: Okay, explain what you mean by ‘depth map’. DH: Basically a whole bunch of mask layers in Photoshop. A colour layer with a mask applied that has a certain opacity value. So there’s a character standing right up in the foreground, I’m going to paint that character 100% white with black around. So that will be completely the foreground colour, and then something 50% back, I have to decide when we get to zero. When is the furthest… you know, it’s something you have to decide for every scene. Stuff that’s in the middle of Z-depth would be 50% white, it would be middle grey. Then basically I would have to… anything with vertically standing things that are standing up in the scene would have to have its own layer, and then I’d have to do gradients for the ground plane, so I’d have to mask the ground plane and do the gradient, and get the gradient to match the standing figures that are positioned along it. Do you know what I mean? DH: Then there’s a wall on the side, like you’re looking at a field with a wall on the side of it. That wall has to have a gradient that matches the gradient on the floor. So it wasn’t a simple thing to do in the end, it was very time consuming. DB: Was it easier than, ‘grass is green, sky is blue’? DH: I think if there was any time benefit, it was that it was a very well defined process, where I knew what I had to do as far as masking things, and it was easily repeated work. The decision about what colours to use in each scene was harder, and took a while, but that could be separated. After I did all the masks I could come back and re-evaluate the palettes across the entire book, and change them. DH: Yeah, so it gave me flexibility, and it let me agonise for three weeks over the colours of the book, and go back through all the PSD documents, reopen them and adjust the two colours and copy paste the hex codes for the colours, so there was a lot of busy work and repetition, but it meant I separated out some of the grunt work from the decision making, which I think was good. I don’t know, that’s what I did. It’s done now. DB: It worked. I think people get hung up on, ‘Did I do it the right way? Does everyone else do this?’ I think that doesn’t really matter if it works, and you’ve got a book. An actual (knocking noise) hard book. DH: I like all these sounds you’re making with the book. It is useful, you can make all kinds of percussive sounds. DB: If you’re into percussion you can, (drumming noise). It’s great! You should buy the book just for the opportunity to drum on it. DH: I never made a book! I never made a physical thing like this, so it was kind of cool. DB: This was through Kickstarter, was it? How did that work then? I understand how it works in principle, but I’ve never run a Kickstarter campaign, and Kickstarter campaigns look like the sort of thing that are very, very easy to get into, and more complicated to get out of. DH: It started like everything about this process, which was small at first, and then getting bigger and bigger. The project was conceived as a much smaller, simpler thing. Like, as small as you can imagine. It was originally going to be a page or two. DH: Literally a page or two, a free comic we would just make for fun. Because of other things shifting in Tevis’s and my professional life at the time, it took on more prominence and we thought we were talking about it so much… maybe if we had just gone ahead and done our first instinct, we would have had a comic done in a week or two, but we talked about it so much, because we’re thinkers, we think it out. So we had so many ideas and the scope, there seemed to be so much potential, and we had so many things to say about the subject that it seemed like it could get bigger. I think it was Tevis’s idea, I like to say it was his idea. DB: You mean you like to blame him. (Laughs). DB: You can be cursed with success. DH: Yes, but before that even, you can be cursed with expecting success. DH: Anyway, the scope can get bigger, because some people, it’s hard not to adopt a little bit of the lottery mentality, which is terrible. If anyone had asked us, ‘Do you have a lottery mentality? Are you thinking you’re going to make $200,000?’ we would have said, ‘No, that’s ridiculous.’ At the same time, there’s this energy you get when you’re getting ready to campaign, and then when you’re campaigning and telling everyone, there’s a fear, and then people come out to support you, and you feel so grateful. It’s really exciting and you feel vindicated, and you see money coming in and it’s like, ‘Maybe we’ll make a lot of money, and we’ll be really set here, and we can take our time and do it right and everything.’ We actually did great, we had a very successful campaign, and we had a lot of support. That said, I think a lot of these campaigns, people don’t realise how fast money goes, after you pay out the fees and you pay for the rewards you’re producing, and split it between two people, and over two years ultimately, which it was meant to be one year. So we had terrific support. Even despite that, it became a challenging process where we were underfunded, but we were determined to do a good job, and we took the time we needed to take to get something out. Now people have it, so we fulfilled our duty, but it was… you know, it’s risky if you’re not great at planning. DB: A baptism of fire. DH: A baptism by fire, yes. I needed the cultural reference points from you. DB: Do you feel baptised by this now? DH: Yeah, I still feel baptised. I felt really baptised in April when we launched. I feel a little less baptised. I think I need to be re-baptised, maybe every six months. DB: Those fires are slowly smouldering out. They just need to get re-ignited! DB: Awesome, so where can people get this book then? DH: We have a website, which is secondquestcomic.com, and you can get the PDF for a few bucks… well, $10, or you can order the hardcover and the PDF for $25. DB: If you’ve got hands and eyes you might want to get the genuine, (drumming noise) the drumming edition. DH: Yeah, it looks nice. I mean, I recommend the PDF, it fits an iPad perfectly, but the book came out really nicely. I really am fond of it. DB: I will agree with that. It has come out very nicely. Spot varnish on the front as well. Ooh! I’m a sucker for a spot varnish. DH: I asked them what kind of tricks can we do, and they were like, ‘Well, we could do a spot gloss,’ so I thought about how we could use that. It looks like the girl’s looking out from this… when it catches the light, it’s like everything else is noise, and you just see her eye looking out through the reflections. I kind of like that. DB: Yeah, nice. Nice touch! And if people want to find out more about you, do you have Twitter, Tumblr, Facebook, websites and the such? DH: Well, the single destination is davidhellman.net, and from there you can find everything. I’m also on Twitter, @davidhellman. DB: Completely intuitive, easy to Google. DH: I designed my name to be Googleable. DB: (Laughs). It’s working very well. Congratulations. DB: And thank you very much for talking to me. DH: It’s been a pleasure and an honour, I really appreciate it.